Late last week (December 12), Christie’s announced that it maintains its position “as the jewelry market leader for the 25th consecutive year”, according to a press release. Christie’s cited historic auctions ( jewelry from The Collection of Peggy and David Rockefeller) blockbuster sales (the Winston Pink Legacy and the Peacock Necklace, among others) as well as an increase in participation for its online sales, although it did not specify numbers. 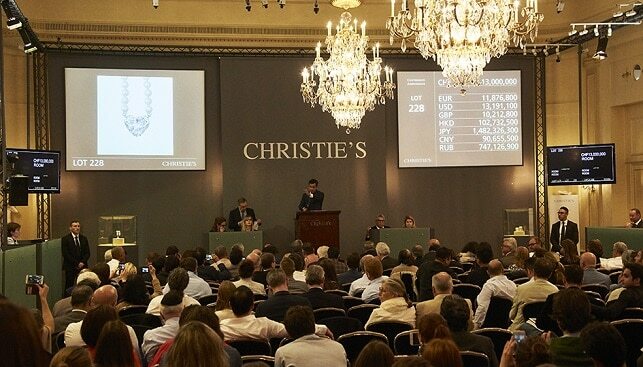 In the first half of 2018, Christie’s is reporting that its global auction, private and digital sales totalled £2.97 billion ($4.04 billion). Christie’s has had a global presence in 46 countries, with 10 salerooms around the world – in London, New York, Paris, Geneva, Milan, Amsterdam, Dubai, Zürich, Hong Kong, and Shanghai.